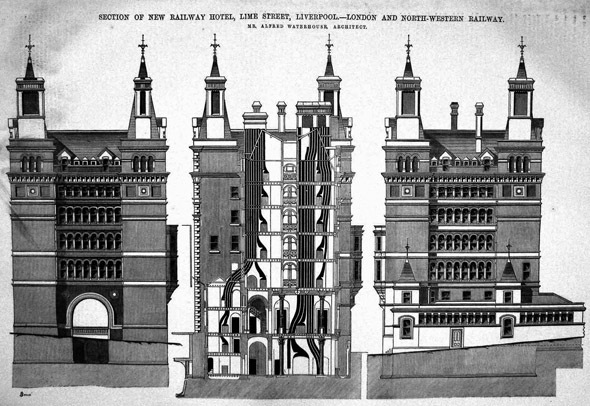 The hotel was built in in 1871 as a railway hotel by the London and North Western Railway to serve Lime Street Station, and contained 330 rooms. The hotel closed in 1933 and remained empty and unused for over 60 years. In 1994 it was bought by John Moores University and converted into a hall of residence for students, which opened in 1996. The building is constructed in stone with a slate roof in French Renaissance style with five storeys, and is a massive 21 bays in length. The end bays and the bays flanking the three-bay centre are carried up into towers. Designated by English Heritage a Grade II listed building. Illustrations published in The Engineer, August 21, 1868.